I blame every one of the Energy and Commerce legislative staffers. 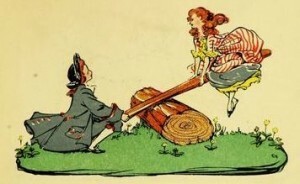 PUBLIC DOMAIN IMAGE from Ethel Everett, illustrator, Nursery Rhymes (1900), courtesy ChildrensLibrary.org. Well, don’t forget the nannies know best. My favorite is always when they express eternal optimism that we businesspeople are just so creative that we’ll figure out a way to comply with CPSIA and stay in business. I don’t know anyone who can outsmart a Catch-22 without simply refusing to play the game. In most other countries, there is a way to outsmart a Catch-22: you ignore the regulations and if some official catches you on it, you bribe him. It’s corrupt, but that’s what it takes to make a statist system work. At present, if you tried this in America you’d get arrested, but as America continues to adopt statism as the new American way, it will eventually catch up with the rest of the world in the practice of corruption and bribery as well. GregS: The problem is that a lot of these small manufacturers don’t sell their products directly to consumers; they sell through big distributors, and those distributors are very easy targets for regulators.